ORCHARD PARK, N.Y. - Buffalo Bills safety Aaron Williams was moving his body on the field before being loaded into an ambulance and taken to a hospital after sustaining a neck injury. Williams' agent, David Mulugheta, provided an update to The Associated Press an hour after the Bills' 40-32 loss to New England on Sunday. Mulugheta said Williams was still undergoing tests. 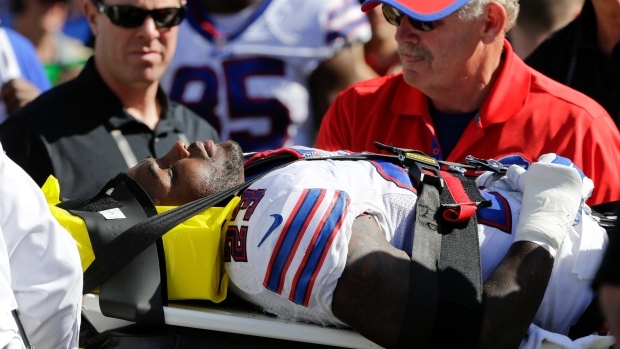 Coach Rex Ryan would only say Williams was taken to the hospital for what he called a "cervical precaution." Williams was hurt while making a diving attempt to tackle Julian Edelman on a 22-yard touchdown catch. The safety's head bounced as it connected with Edelman's back and both players hit the turf, leaving Williams skidding face down on the left sideline. Williams was talking with trainers as he was put on a stretcher. His body was immobilized before being loaded onto the ambulance.